Fair Oaks Tree Services has been carrying out a lot of work around the lovely Kingswood area of Surrey recently. With lots of large mature trees in the area, we have been very busy with crown reductions, dead wooding and tree inspections. The Project: Crown Reduction on a Robinia Tree We advise all our customers with large trees in their garden to have them checked every 2 to 3 years. Inspecting trees regularly will benefit in keeping homeowners, the trees and the public safe by noticing problems and rectifying them before they get worse. 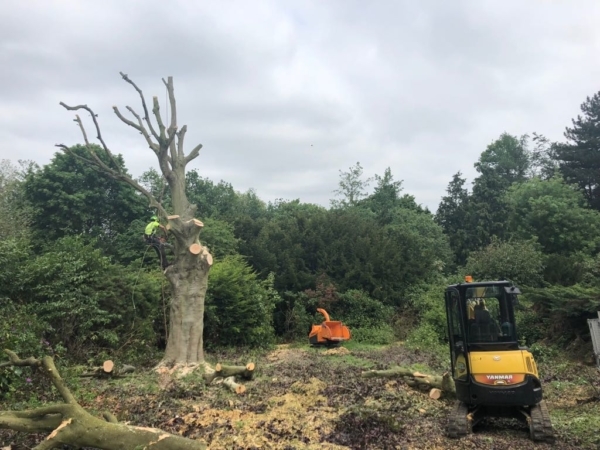 Large copper beech tree removal in Esher, Surrey.